The web doesn't have any good way of bookmarking any spot in a web page. With some help from the web page author, we can bookmark a specific anchor or node id in the page, but most particular spots are still not reachable for bookmarks. I just tossed up a little user script that makes any node in the page addressable by an XPath query bookmarkable. It's mostly for XPath power users, for now, but works well (and lets you load bookmarks using that technique, which you might have gotten from such people). Having installed that, you can load bookmarks like http://tibet.dharmakara.net/TibetABC.html#xpath:/html/body/h2, and get zoomed in to the right part of the page immediately (here, the part featuring how the Tibetan numbers are spelled, what they look like, and approximately how to pronounce them, for us westeners). Which means what? Well, it ascertains that the page loaded is HTML, which people tend to take for granted, but which is not the case for all pages on the web. Especially, it is not the case for text/plain pages, by the broad masses more commonly known as *.txt. In Firefox, text documents get rendered much like HTML pages, but in a <pre> encasing. Saving the document will remove this "HTML enclosure", but if your script injected some other junk, like an interface of some sort with some text, for instance, the saved page also will. This is probably not what you wanted. It is at the very least certainly not what unsuspecting users of the script wanted. But please do decorate your scripts with the above line. It's royalty and patent free software with an irrevocable, DRM free license for all time. Public domain, at its best, working for you. Cheers! In the real world, I regularly sing (tenor) in my local choir. Choirs have some boring administrative burdens, like keeping track of what sheet music is being sung now, and what should be returned to the choir library. In our choir, it's manual labour handled by each member and coordinated by a clerk we elect every season. 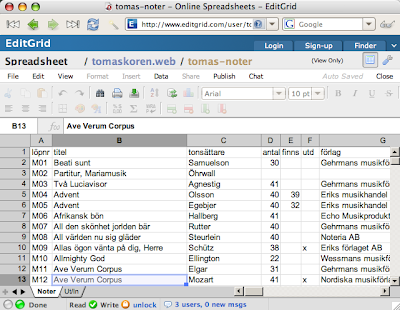 This EditGrid spreadsheet is open for public browsing. Firefox+Firebug users beware: unless you turn off Firebug for that domain, on visiting an EditGrid spreadsheet, your whole Firefox session (all tabs of all open windows) will freeze beyond salvation (due to issues with Firebug's XmlHttpRequest monitor, if I remember correctly). To avoid that issue, first go to the front page and right-click the Firebug icon, selecting "Disable Firebug for www.editgrid.com". Then it's safe proceeding to the spreadsheet itself. The administrator of course has an account with edit rights to the data; you will only be able to browse it. 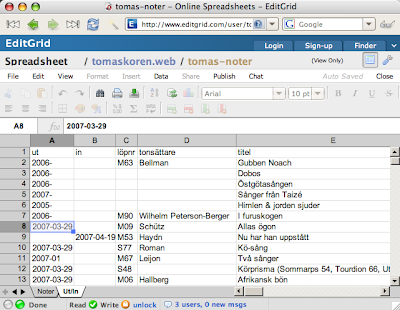 As mentioned in a previous post, EditGrid can export data in mostly any format you want, including JSON, if not out of the box yet (EditGrid devs: even if you don't support native JSONP yet, it would be helpful if you let users share their xsl transforms, so it gets easier to copy recipies such as this one). As I already had set up my account with a nice JSON data format exporter, I opted to reuse that (with the future option to make an Exhibit interface for the data set of what we sung when and the like, without any fuss). One good thing about work is I find it a lot easier to be rational about building (or buying) the best tools for the job. I've known for over a year that I should have the power tools I equip almost all my Greasemonkey scripts with in the Firebug console too, but never came further than to request the feature, at some time, ages ago. Today I extended Firebug's $x(xpath) to handle $x(xpath, contextNode) too (catering relative xpaths) and to return strings, numbers or booleans, when the expression resulted in such output. $X is a variant on $x, which will return a node rather than an array, when the result was a node set. Instead, you get the first match, in document order. You'd be surprised how comfy and useful that is. These tools cut down the user script development feedback loop overhead for me quite noticeably. They also work even in a framed environment (when you pass a context node), which the former Firebug $x did not. After patching up the build script a bit until it worked (so I could test it out), I submitted the patches to the Firebug list, so they might end up in the upstream 1.0.6 build as well. Relative XPaths are very useful for answering lots of intricate questions about web pages that you'd have to work for quite a while with the DOM inspector or Firebug's HTML view to figure out. If you like me like to bookmark comments you've written on some web page, you ideally want to find the closest anchor before the place where your comment showed up. Good blogs have easily clickable links around the comment to help you do that; others, like Ajaxian, don't. Then it's just the matter of bookmarking as usual. Since Firebug's console features are not exposed to the page, you unfortunately can not make a bookmark out of it, but it's nevertheless a good example of what you can do with this. I had been dragging my feet for a while, hoping the Simile subversion repository would get a nice web based Trac timeline over commits and change sets, if I asked nicely and waited patiently. That very often helps with open source projects (Edit: this time too, eventually), but not always. Last weekend I took to setting up a local mirror of the repository to set up my own, local, Trac, just to get that timeline/changeset browser combination. I find it indispensable for software development with more than one developer (and a very useful tool, even when you're on your own). Thanks to SVK (a rather mature perl concoction running atop the subversion filesystem and remote access layers -- see the svk book for more info, for instance), it is actually rather comfortable to set up your local subversion mirror of a remote repository, whether your own or someone else's. Even saves you some disk compared to a common subversion repository. Then I got to answer to some questions; name my Trac instance Simile, point it to the repository root /Users/vc/.svk/local, say that it is an svn repository and get pointed to the config file ~/trac/simile/conf/trac.ini, which needed some editing. If you want full commit messages in the timeline (I do), make sure you keep wiki_format_messages in the [changeset] section and changeset_long_messages under [timeline] both set to true. You'd think these options are orthogonal from their names, but they are not; the latter is happily ignored if you turn off wikiml. So even if, like in my case, commit messages aren't wikiml markup tied to the wiki and issue tracker inside this Trac instance, it's either pretend it is, or get truncated commit messages. Starting it is done with tracd --port 8000 ~/trac/simile (or something more permanent, by way of Apache or similar), and you can browse at http://localhost:8000/, once come this far. If you want some more linkage and less round trips between views, feel free to tuck in my Trac Timeline and Trac Changeset improver Greasemonkey scripts crafted for this particular purpose.